Most new WordPress websites are company or business related website intent on generating income and other business opportunities. Going with WordPress is a smart choice but there are several things that need to be done in order to get the most out of your WordPress installation. This is one of those often overlooked areas of managing a new website and yet affects many businesses worldwide each and every day. All websites are prone to attack, spam and hacks. WordPress is no different. A hacker with the ample motivation and time will find a way in into your website and bring your business to its knees. The trick is to close these vulnerabilities and to throw enough obstacles in the hackers path to make the effort of hacking your website less desirable. Out-of-the-box WordPress is fairly secure however there are many free and premium plugins that can be used to further secure your WordPress installation. In addition to the options listed above, we provide our clients with a fully-managed security suite that can help to keep our clients’ websites safe and secure. Murphy’s Law states that if anything can go wrong it will go wrong. Things can go wrong for a variety of reasons including hackers, viruses, server failures, data corruptions, acts of nature and so on. Managing a website effectively should always include a backup and recovery plan to limit your website’s downtime when things do go wrong. Creating a backup and recover plan typically involves a scheduled backup of files, databases and defining a detailed recovery procedure which can include moving your entire website to a new web server at a moments notice. The goal is to get your website up and running in the shortest time possible. This process can get quite complicated however and as a result many website owners opt to simply cross their fingers and hope nothing does go wrong. Unfortunately something will ALWAYS go wrong! Murphy’s Law remember. What if the recovery process could be simplified and scheduled backups could be run on auto-pilot? Fortunately with WordPress there are several plugins that can make that happen. We’ve listed a few of the best free and premium backup plugins below. Here at Painted Pixel Studio, we provide weekly automatic backups for all our clients’ websites free-of-charge. In addition, we can provide daily backups and off-site backups for a small fee, which works out to be much cheaper than other backup options offered else where. There are a many hosting companies available throughout the web. Some of these even promote up to 3 years of hosting for only US $3.95 / month! What a steal! Unfortunately in most cases you get what you pay for. Web hosting power, stability, speed and flexibility can differ greatly depending on who you go with and whether or not you decide on shared hosting or dedicated hosting. Shared hosting is a web server that is used to host as many as 100 websites on a single server. All websites hosted on that server will split the server resources including bandwidth, processing power, memory and so on. This is why many hosting companies can offer greatly reduced costs for shared web hosting. Dedicated hosting on the other hand will host only one website per server, resulting in more power, speed and stability but at a much higher cost. In addition, many dedicated servers require you to manage them fully, increasing the time and cost required. So which is better for a WordPress website, traditional shared hosting or dedicated hosting? In our opinion, neither is. Traditional shared hosting servers just aren’t strong enough to effectively run most WordPress installations yet dedicated hosting is overkill in many cases and is far too expensive for most companies. Therein lies the problem, there is no middle-ground. Many WordPress specific hosting companies have begun cropping up of late. These hosting companies are geared towards hosting WordPress websites exclusively, which in turn makes for better hosting at a much lower cost as compared to dedicated hosting. This definitely is a better option for hosting WordPress websites but again, our feeling is that in some cases this form of hosting is still too expensive for most small business. Introducing SiteGround’s GoGeek hosting package. This is the middle ground we’ve been waiting for! The GoGeek hosting package technically is shared hosting but the difference is more power and less shared websites. This translates to a better website experience for your visitors and keeps more money in your pocket. Painted Pixel Studio uses SiteGround hosting exclusively for all our hosting packages and client websites. It’s simply not enough to have a website anymore. In order to get measurable value from your website you need to promote it, and on the web this is done with SEO. SEO (search engine optimization) helps to analyze and optimize your website for those keyword search terms that best represent the products and services you offer and in turn generate targeted traffic to your website. In addition, other forms of internet marketing and social networking can be used to create a complete and cohesive strategy that can help to launch your website to new heights. There’s only one problem, how many website owners have the knowledge and time to do this for themselves? Not many but fortunately Painted Pixel Studio does. We build and manage successful SEO campaigns for many of our clients. Take a look at our SEO services to learn how we can help you. How many visitors and page views is your website receiving? How much time are visitors spending on your website? What are your top entrance and exit pages? How are visitor finding your website? Fortunately, there is a way to answer all of the questions above and more. Google Analytics is a the most powerful website analytics tool available to website owners anywhere. Best of all, it’s absolutely free to use! Analyzing key website analytics is important because it allows website owners to make decisions for their website based on concrete data. For example, if you find that a particular page is getting lots of visits but very little in the way of conversions, you may have a problem with the page’s content or call-to-actions. It’s time to make a change! Setting up and running a website isn’t a set it and forget it type of thing. A website needs to be monitored and maintained. This will ensure the website is functioning well and continues to provide your visitors with the experience you want them to have. 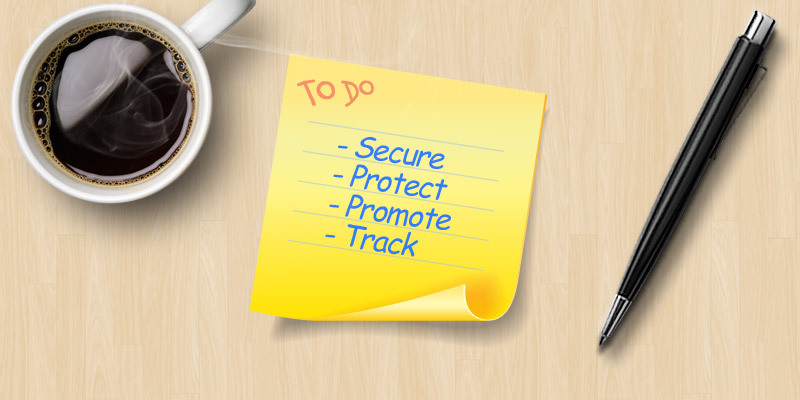 Making sure that you secure, backup, track and promote your website will go along way to ensuring the continued growth and success of your website and will save you plenty of dough in the future should things go wrong.